Uterus - Necrosis in a female F344/N rat from a chronic study. Fibrosis and mineralization are present in the necrotic uterine tissue. Uterus - Necrosis in a female F344/N rat from a chronic study (higher magnification of Figure 1). There is fibrosis and mineralization of the necrotic uterine tissue. 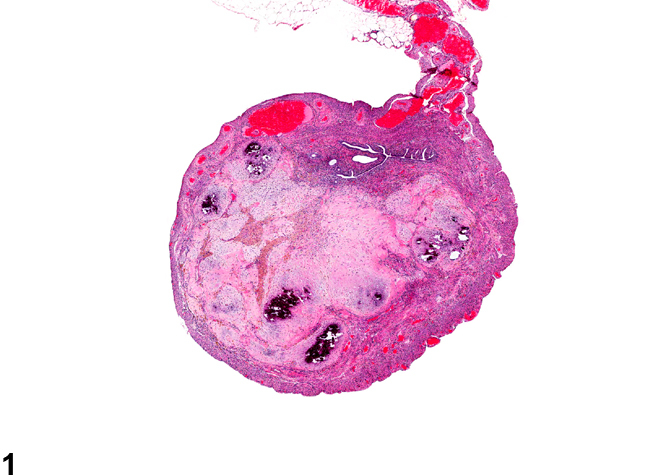 Uterine necrosis is rarely encountered, but the histology of the lesion is like necrosis elsewhere, with cell death in the tissue characterized by nuclear pyknosis and/or karyorrhexis, cytoplasmic eosinophilia, and cellular swelling or shrinkage initially. The consequence of necrosis is granulation tissue and mineralization ( Figure 1 and Figure 2 ). Uterine necrosis may occur due to associated arteritis or thrombosis and subsequent infarction of the tissue ( Figure 1 and Figure 2 ). Uterus - Necrosis should be diagnosed and graded. If the necrosis is secondary to another lesion, such as inflammation, it should not be diagnosed separately unless warranted by severity. 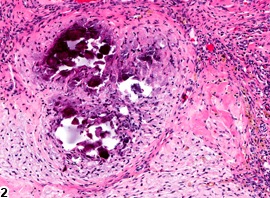 Lesions secondary to necrosis, such as inflammation or hemorrhage, should not be diagnosed separately unless warranted by severity. 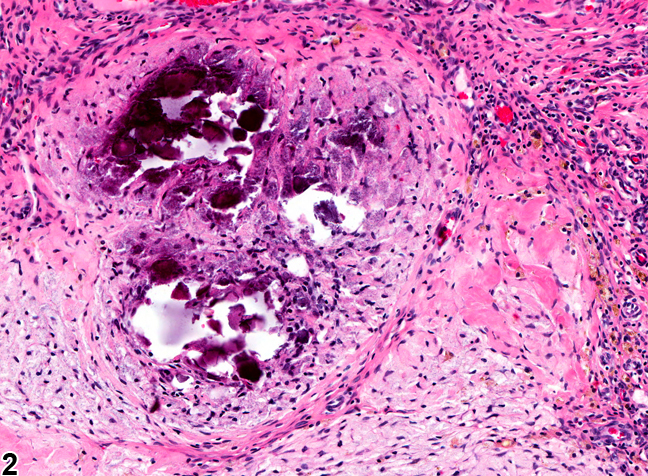 The pathologist should note in the pathology narrative if the necrosis is thought to represent an infarct. National Toxicology Program. 1990. NTP TR-393. Toxicology and Carcinogenesis Studies of Sodium Fluoride (CAS No. 7681-49-4) in F344/N Rats and B6C3F1 Mice (Drinking Water Studies). NTP, Research Triangle Park, NC.